Good morning, studio fans! This is my belated new-year message for 2016. It usually takes a while to get my ʻōkole in gear after the holidays and the lovely celebrations for my birthday in early January. Yesterday I was most inspired by the Royal Hawaiian Band concert at the palace grounds, where I walked after lunching with a friend in downtown Honolulu. ʻIolani Palace grounds during the Friday noontime performance by the Royal Hawaiian Band draws an appreciative audience. The program featured the music of Liliʻuokalani in remembrance of the overthrow of the Hawaiian Kingdom in 1893. My friend Malia is the Band’s soloist, and I was glad to hear her sing. She is a phenomenal vocalist. What a gift she has. The entire program was very uplifting. I awoke this morning with the tunes in my head and a vow to keep music in my life; learn or practice something new every day. Reminder number one! Reminder number two: Take time to socialize with others and make friends, especially as I grow older, to keep my attitude and perspective in check. Besides, it’s fun! Becky, the friend I lunched with (she is like a sister to me) listened as I inventoried my current health issues (I go in for an annual physical around my birthday). I thought she was being sympathetic, but being younger, she said her interest was in learning what problems she might expect for herself in the future. Humph. We had a good laugh over that one! Big sigh. “You know, a long time ago, maybe the Russians and the Germans couldn’t marry. I’m talking about ancient history,” the child said. “And that King!” Clearly she wanted an answer, and I almost forgot the original question. I’m drawn to her (my) confusion. King Kamehameha? King Kalākaua? “Well, Ayla, if you are asking about the color of your skin or descending from Caucasoids, then yes, you are White,” I said. As I mused, if she is white, what am I: brown? yellow? beige? Thank you, Eric Whitacre and team! Handbell choir members talk to audience on stage after the performance. Here are some of the bigger bells. The largest, a low C, weighs almost 15 pounds. I skipped out early from my Windward Community College Tai Chi Class last night to hear the Handbell Choir from Hakuoh University (Oyama City, Tochigi Prefecture, Japan) in a free public concert at Paliku Theatre on the same campus at 7. 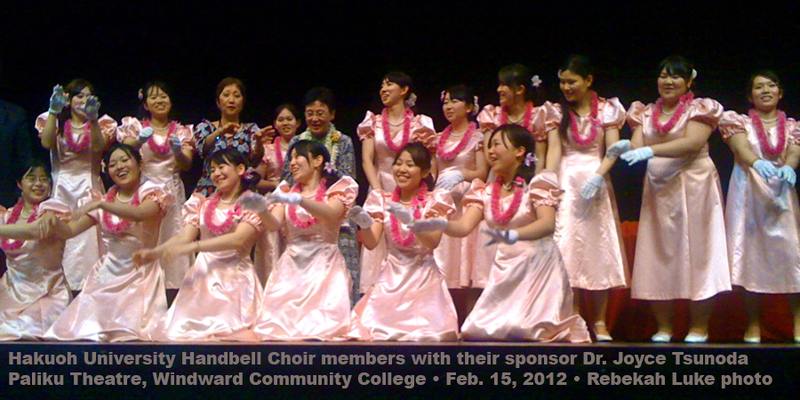 It was the choir’s 21st Goodwill Tour of Hawaii, but the first time I’d heard their music. The beautiful full sound of another bell choir at a music festival in 1987 captivated Professor Hirotaka Arai so much that he was moved to start the all-female choir. Today’s choir can ring seven octaves of handbells with 100 to 120 separate pieces. Of the 11 numbers last evening, Music Director Arai arranged six of them. Listening to handbells is a rare treat. Watching 19 young women ring them is very interesting. There is more than one way to play the bells. Grasping them by the handle and shaking them in the air, hitting them on the table, or laying them on their side and playing them with drum mallets. One at a time, or up to four at a time. I closed my eyes occasionally, just to listen to the music without watching the performers or the director, and I found I could get lost in the sounds and songs of the bells. Especially during “Jupiter” by Gustav Holst and Leonard Bernstein. I got way out there! 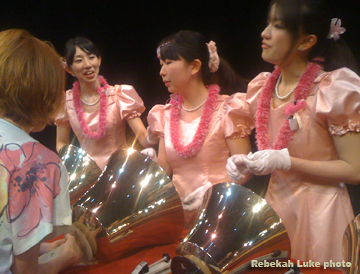 The Hakuoh Handbell Choir sings and dances hula to “Pearly Shells” while waiting for official photography. Their sponsor in the back row with the light-colored lei is Dr. Joyce Tsunoda, past head of the University of Hawaii Community Colleges system (and my former boss. It was great to see her!). Excited and inspired this morning! 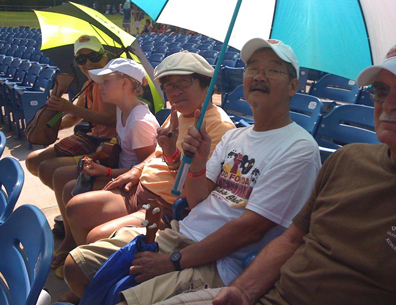 What with a fun day yesterday at the Waikiki Shell with DH and my friends. We went there to join hundreds of others in an attempt to break the Guinness world record for the most number of ukulele players playing the same song together in the same venue. With none other than ukulele artist extraordinaire Jake Shimabukuro leading. And connecting with my first cousin once removed J.H. Kim On Chong-Gossard to collaborate on a sequel to The Chong Family History. Nope, we didn’t break the record. 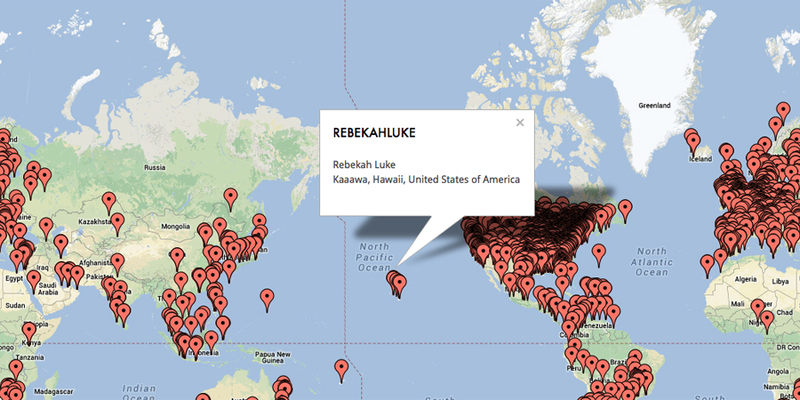 😦 There were a little more than 1,050 ukulele players, and Hawaii needed a little more than 1,500. The Waikiki Shell has seats for 1,958. The current record? It’s held by Sweden! Even though we failed at the Guinness thing, the effort raised a lot of money for charity. I guess we’ll have to hana hou (do it again). http://www.gofordarecord.org informs all about the effort and the event. We're waiting for the attempt to begin AND for people to fill up the seats behind us. These are my friends Colleen, Skyler, Pi‘ikea, cousin Nathan, and DH. It was in the heat of the day, and we waited until the last minute to take out our ukulele so the instruments wouldn't be damaged (so advised Nathan who is a luthier). Bottom line: we had fun! Of course we were surprised that more people didn’t turn up for this, especially with the social media capability that we have now. I guess one can’t just post something on the internet. You have to tell people that you posted and how to find the information. And remember that not everyone “does” the internet. Which brings me to my cousin. I call him Jim. Around the studio, behind his back but within earshot, we call him Teddy Bear Jim in honor of his vast collection of the stuffed toys. He calls himself K.O. for Kim On, that was his grandfather’s name, that he asked for and took legally. Jim is our family genealogist. He’s on vacation from the University of Melbourne where he teaches, to crank out a book in time for our family reunion in August 2012, or at least do the research in a couple three of weeks time. The first time he did this was 20 years ago, and The Chong Family History told about five generations, starting with my maternal grandparents who met at an orphanage in China. Jim would come here from America as a student on his spring and winter school breaks and interview our large family. My Chong Hee Books publishing company was born, and we held our first family reunion. 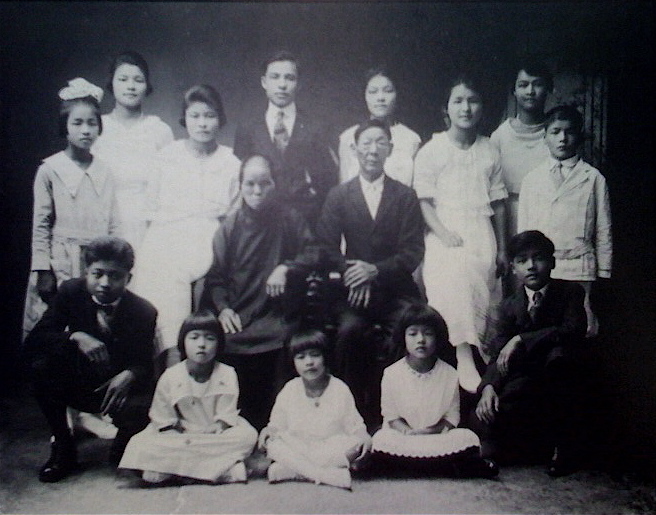 My maternal grandparents and 13 of their 15 children in Kohala. My mother, seated front row and center, was the baby of the family. Jim's grandfather is standing, far right. All of these ancestors have now passed. They comprised the first and second generations. Today, generation number six has shown up. We'll have a big reunion in 2012. Publishing was not as computerized as it is today, so I am excited at the prospect of how more creative we can be with the sequel update, and perhaps even making it available as an ebook. I can’t wait to see Jim in person on Tuesday. Meanwhile we are tossing ideas back and forth wirelessly. I am so proud of him. He got a new cell phone and joined Facebook—finally! Thanks for visiting again! I’ve been away from the studio a bit, doing some cool stuff. It’s never too late to learn something new! As my Facebook friends already know, I went to a choral conductors workshop one weekend and a food forum with farmers and chefs the next. A last-minute private plea to attend a choral conductors workshop appeared in my e-mailbox, saying only five conductors and four singers had signed up. What a shame, because a delightful gentleman named Rodney Eichenberger was in Honolulu to show and teach how a choir director’s posture and hand movements produced a corresponding sound from a group of singers. A conductor’s conductor, the professor was now in his 80s; and who knows when he would come to the Islands again. Would I consider attending? With 30 dollars I registered as a singer for two days (Conductors need singers! ), with meals included. To me, this was a good deal, to learn from the best! I enjoy choral singing: school choirs, church choir, pit chorus, Honolulu Chorale, lunchtime choir, glee club, neighborhood Christmas carolers. If the opportunity presents itself and it feels right in my heart, I’m there. • No talking. Except to identify the title of the piece, line or measure. The time spent talking is put to better use singing. • No playing of individual voice parts. Just start right in and sing the piece start-to-finish two times. This encourages sight-reading, he said. For those singers who have personal issues with the music, they will resolve the issue by the end of the second time through. We had just one exception to this rule when the accompanist pointed out that the melody line was not being sung correctly. • Conduct from your energy power center, your dan tien, not any higher or lower. Dan tien is a Chinese tai chi term referring to the area of your body about the size of your fist, below your navel and toward the curve of your back. Described another way, when conducting keep your hand movements directly in front of you, about waist level and below while standing perfectly straight. *Trust the singers. They are here to sing and will deliver. Each conductor took a turn at conducting a new piece. Then Rod would explain and show how to make it better. A turn of the wrist here. A tiny pinch with the fingers there. He found something to improve in each conductor’s style. In a second rehearsal each conductor could review a challenging passage with the singers, and Professor Eichenberger would suggest further changes. The workshop results were so remarkable, our teacher had all of us giggling! So easy, so much better, and so much fun! In the end, I recall, say, eight conductors each with just a few minutes of instruction, eight new pieces music, and three dozen singers learned remarkably simple and logical choral technique. With an amazing piano accompanist who was reading the music the first day for the first time herself, we performed a concert at 8 p.m. on the second day. We were good! I feel so lucky to be a part of this group experience.